What was it: Both burgers were the same; it was basically a Quarter Pounder – with bacon and special barbecue sauce named after either Larry Bird or Michael Jordan. Recently a 20-year-old bottle of McJordan BBQ sauce was sold on eBay to anonymous buyer in Chicago for $9,995. What was it: Chopped onions shaped into small solid pieces, dipped in batter and deep-fried. Apparently, before stumbling onto the idea of making chicken nuggets, they thought onions would make better nuggets. What was it: A chicken fajita wrap, with a packet of sauce. Although, I don’t know if I would trust buying Mexican food from McDonald’s. What was it: McDonald’s attempt at entering the pizza market. It started off in a few select markets, before growing to over 500 locations. 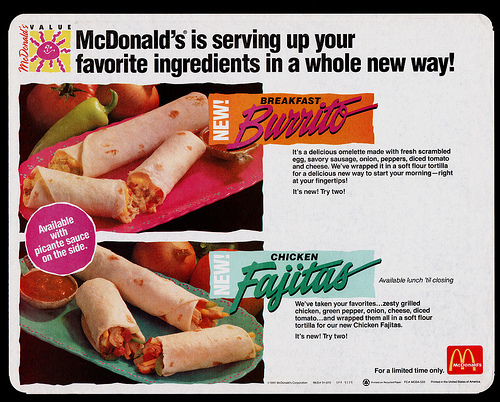 Eventually the McPizza was discontinued all together due to the amount of time it took to cook. What was it: A more “gourmet style” hamburger marketed towards adults. The ingredients were a quarter pound of beef, on a potato flour bun, topped with bacon, leaf lettuce, tomato, American cheese, onions, ketchup, "secret" mustard and mayonnaise sauce. Despite the massive and expensive marketing campaign it was a major flop. What was it: An entire salad shoved into what appears to be a Frappuccino cup? The McSalad Shakers were only around for a short time and were replaced by their Premium Salads in 2003. What was it: It was a healthy reduced fat hamburger created to appease critics and appeal to health conscious customers. What was it: A burger that was made up of three beef patties and two slices of cheese, served on the sesame seed roll. It was originally created and marketed as promotional tie-in for the film Batman Forever. What was it: The Cheddar Melt was basically a Quarter Pounder that was topped with onions (sauteed in butter and teriyaki), then topped with cheddar cheese sauce, it was also offered a few times in ‘90s, and most recently in 2004. What was it: The McDLT, which stood McDonald's Lettuce and Tomato was a burger sold in a specially designed two-sided Styrofoam container. 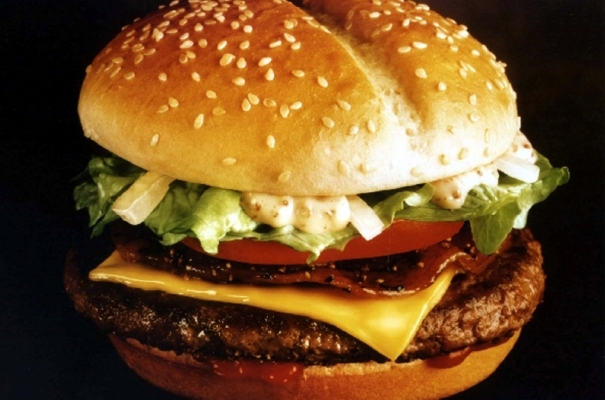 The meat and bottom half of the bun were placed separately from the lettuce, tomato, American cheese, pickles, sauces, and top half of the bun. Customers then combined the hot and cool sides. It was discontinued in January 1991 due to environmental concerns with the Styrofoam container.